Screenshot of a tweet from my favorite person/poet/writer ever, Saeed Jones AKA @theferocity. I was elated to find out that Colson Whitehead won the Pulitzer Prize for Fiction with The Underground Railroad (Amazon | Indiebound), which I read and reviewed on this blog last year (Read: A Lifetime of Remembering with Colson Whitehead). I have yet to read Tyehimba Jess’s book of poetry Olio (Amazon | Indiebound), but I am planning to while getting into this month’s poetry books. We’re about midway through April, National Poetry Month, so are you getting your daily dose of poems? Check out a girl’s lifelong affair with poetry. If you’ve been weary from the news these days, from Trump’s brand of all-the-things-your-worst-dreams-are-made-of, here’s a little reprise: hope. I’ve been using Deepak and Oprah Winfrey’s latest meditation series (cost: free) called Hope in Uncertain Times and it’s been giving me the kind of peace and calm I need. I’ve been a fan of these series since 2013, and trust me — this stuff is gold. After doing the necessary inner work, there’s a ton of things happening around us we can always be plugged into. Unless you’re a monk, of course, but for folks like me (brown, queer immigrant activists in the belly of the beast) there’s this: Peace Tour 2017. In this week’s book review (War and Turpentine by Steffan Hertmans), I wrote about reading the story of the author’s grandfather, who was a soldier and a painter. I intentionally omitted the war years, because 1) honestly not a fan of war novels and 2) here we are in another war again, dropping missiles on other nations (Syria). What I don’t see in the realm of international geopolitics are attempts to address the root causes of conflicts, which is why the Peace Tour 2017 gives me infinite hope. As a Filipino, I’ve long wondered about the longstanding civil war between the government and the “other government,” led by the Communist Party of the Philippines. If you’re interested in finding out more, look up to see if the tour will be making a stop in your city! Damn good homemade pasta at Affina. Also: live music in someone’s living room in San Francisco (yes, like the good ‘ol days). Lattes in the rain, specially turmeric lattes like the one pictured below from As Quoted in San Francisco. Have you ever fallen in love with a magazine? Because I have, four times a year for three years now. 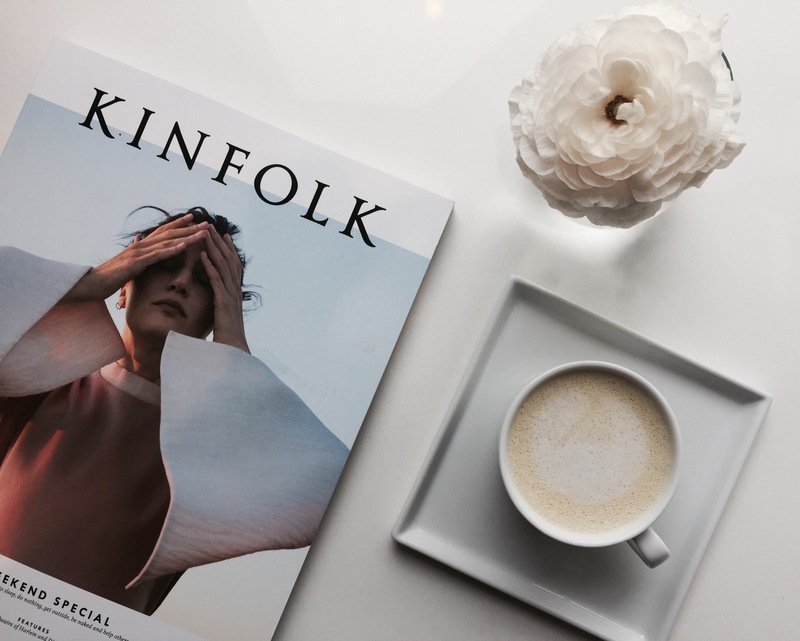 Kinfolk magazine, to be exact, which is one of a kind. It’s a lifestyle magazine filled with thoughtful pieces on philosophy, music, culture, art, design, fashion and cooking. Reading it is almost meditative; you can’t help but be completely present to the page. Imagine my joy at As Quoted cafe with Kinfolk as pictured above, as I read and learned about Shoshin, a Buddhist concept of “a beginner’s mind which refers to having an attitude of openness, eagerness, and lack of preconceptions.” Total hyggeligt.